From Fort Myers to Marco Island to Naples, you can bet if you’re looking for the best live band for your next corporate event or you want the perfect steel drum band for the ultimate beach wedding, look no further than RythmTrail. With over 20 years of experience playing the best soca, reggae, calypso and steel drum music, you can be sure you’re going to get the best musical talent from native Caribbean island steel drum players who can play it all! Whether you’re looking for complete steel drum bands with a huge sound or you just want a small steel drum solo, RythmTrail has got the perfect songs and sounds for your beach wedding ceremony, wedding reception or other special event. RythmTrail is ready to provide your Ft. Myers, Marco Island or Naples Florida event with romantic, festive or even suspenseful music to create the perfect mood for guests of all ages and audiences. If you’re looking to create your own personal playlist of songs, RythmTrail can follow your lead. Or if you’re not sure what songs will best set the mood for your party, let RythmTrail set the tone for you. Whether you’re in Florida, across the nation or far away in an international destination, call RythmTrail today at 866-495-4522 or get a free quote online and take your next event to a tropical island paradise. Ephraim, it was a pleasure as always. You make our parties with your wonderful music and sounds! Thank you for entertaining the other evening. I will recommend you whenever I have the opportunity. Just a quick note to thank you for your entertainment at our 15th Anniversary Dinner last week. We received numerous compliments from our guests during the evening, and one of the highlights was definitely the band! Your performance was lively and entertaining, and though our group is not chock full of dancers, there were several who were considering taking to the dance floor – which is saying a lot! Working with you and RythmTrail was easy and professional, and we would highly recommend you to anyone considering live entertainment for their event in Naples. Should we find ourselves back in Naples for a future conference, we know where we will look for entertainment! Thanks for the wonderful music at our party on Sunday, sorry for the moving around but you and your guys pulled it off seamlessly. Your band was great hope to hire again soon. Our Steel Drum Player will be performing at the Hyatt in Bonita Springs FL for a corporate reception. We will be jammin in Fort Myers FL tonight at a private house party. Hire the best steel drum players in Ft Myers. Our steel drum band will be jammin at a wedding cocktail hour reception tonight at Gasparilla Inn in Boca Grande Florida. Hire the best steel drum players for your wedding event. We are playing at Naples Beach Hotel & Spa today for beach wedding ceremony and cocktail hour reception. The best steel drum players in Naples. Playing for a wedding cocktail hour reception in Marco Island Florida today at the Marco Island Marriott. Hire the best steel drum players in Marco Island. Our steel drum band will be playing in Naples FL today at Hamilton Harbor Yacht Club for the boat show. Book the best steel drum players in Naples Florida. Jammin at The Naples Beach Hotel, Naples FL tonight for pre wedding party / rehearsal dinner. The best live steel drum music for events in Naples. The best steel drum music in Bonita Springs Florida. Beach Weddings, parties and corporate functions. Where is RythmTrail Steel Drum Band playing today Feb 18 2016? Our steel drum players will be jamming at the Pinkshell Resort tonight in Ft Myers FL. Hire the best steel drum music for beach weddings, parties and corporate functions in Sanibel Island, Fort Myers, Naples, Bonita Springs and Marco Island Florida. 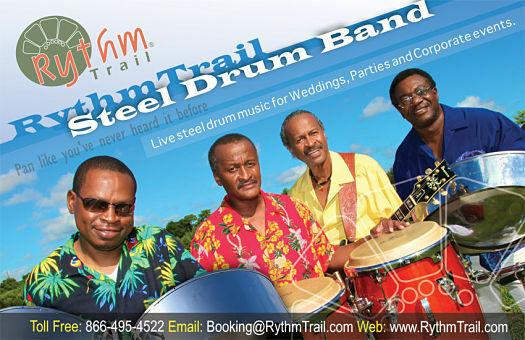 RythmTrail steel drum players will be playing at a Wedding Ceremony in Sanibel Florida. Hire the best steelpan players and Jamaican Steel Drum music for beach weddings, private parties, corporate functions, grand opening, anniversary party, baby shower, rehearsal dinner, luau pary and more in Sanibel Island, Captiva Island & North Fort Myers Florida. The best in steel drum entertainment.